Marie Andrée Barge, Sister Marie Christophe, was born on 3 September 1925 in Thiers, France, the only child of parents who did not know God. When she was 4 years old her mother died, thus leaving her to grow up with her father and her grandmother. She experienced a difficult childhood in a secular, Godless atmosphere, one that was even hostile to God. However God was not far away…and in the wink of an eye, was going to change the course of her life. At 15 years of age, she was working in a Christian family, and it was there that she was going to experience her journey to Damascus. Without any premeditation, even without understanding, she said: “I believe in God”. It was a completely gratuitous gift. At that moment her life changed radically. God’s gift was so powerful that after 3 months of preparation she was baptized; it was on Low Sunday in 1942. Now baptized, she gave herself whole-heartedly to the Lord. It was the beginning of her Religious and Missionary vocation. 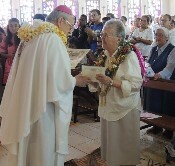 Postulancy, novitiate….everything was new for her. On the 24th September 1946 she pronounced her first vows, the total gift of self made with all her generosity and youth. She was 21 years old. 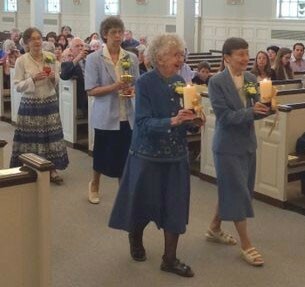 After profession she continued to serve in the community in France while waiting to set out for Oceania in 1950. Wallis was her destination: Malaetoli, Mata’utu, Hihifo… from South to North she gave the best of herself: education of the older girls, teaching… her knowledge of the Wallisian language opened many doors for her. 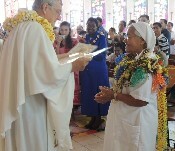 Then, in 1965 she was assigned to the school at Sigave on Futuna. .. Isolation was very real there: no road, no plane. A boat that came every 3 or 4 months was all that linked this island to the world. That’s mission! 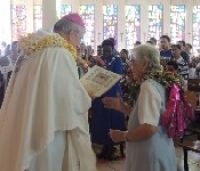 It was in 1973 that Sr. Marie Christophe was going to get to know the islands of the New Hebrides (which has now become Vanuatu): Santo, Vila, Olal, Lamap, Imaki on Tanna island… many trips back and forth on the mission boat St Joseph, the plane or in small, not very solid boats in what were often rough seas. Many times she experienced poverty, the lack of all that would seem indispensable today. From 1882-1984 she would have a time of home leave in France and of service in Rome, before returning to Vanuatu. 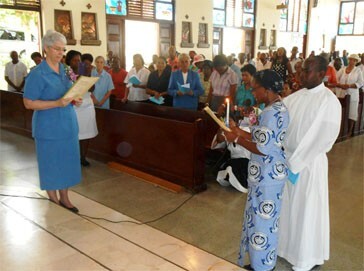 It was New Caledonia that welcomed her in 1989: La Foa, Ile des Pins, St Louis, the Nazareth community at Riviere Salee. It was no longer the students that profited from her gifts, but the communities. Her cooking skills were precious in creating a good atmosphere in the community. In order to regain her strength, several times she returned to France: in 1975 for her first time of home leave after 25 years of missionary service. That was enough to make her feel disorientated back on French soil. 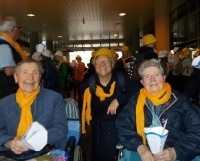 She would again return on home leave in 1982, 1990, 1996, 2002, 2007…always happy to see her family and friends again. And since 11 May 2015, Marie Christophe made the most of residing in the new Nazareth community house at Mont Mou. It was a time of retirement, especially a time of prayer, of contemplation. It was there, on 23 May that she had a fall which resulted in her being hospitalized, initially at Medipole and later at Nouville. For Sister, a long and difficult journey to Calvary began…culminating on the 8th November when the Good Lord called her to Himself. Let us give thanks for this life totally given in joy and availability, in the manner of Mary, whom she trusted completely. 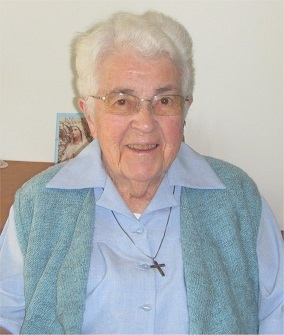 May Sister Marie Christophe continue her service of prayer for vocations. She prayed a great deal for priests, particularly for the young priests.